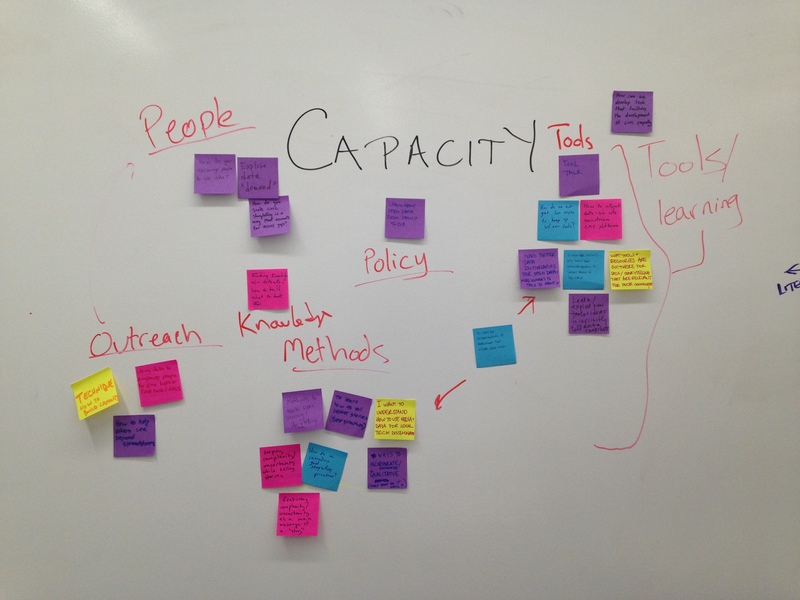 This is a blog post summarizing the "Building Capacity" session of the Berkman Center Teaching Data Storytelling for Civic Impact Study Group. This blog post is based on the collaborative live-notes we took together on Thursday March 19th. People's capacity to do storytelling with data varies widely. Working with data requires such a varied skill-set that it is hard to build all the capacities one needs to do it well. On top of that add the idea that you are helping people use data to create civic impact, and it is even harder! This session focused on how we are all building capacity among others to do this type of work. We started off with a number of case studies, and then broke-out into 2 groups to talk about issues related to building capacity in various audiences. Rahul does a lot of work on capacity building along the lines of data literacy and storytelling. He starts by asking the goals and audience, then moves on to asking about data and the storytelling element. He wants to share two activities that he will describe. The first helps people learn how to do quantitative text analysis by using an online Word Frequency Counter to analyze music lyrics. The second activity is about how to find stories in data. He wonders how to bridge from "cute" stories to real stories with impact. Some folks responded that stories about about nuance and emotion, and perhaps the worksheets are too prescriptive. Ivan is the executive director of Global Voices and it is a platform that brings bloggers, activists together to highlight stories that are important to the local communities. He wonders how they can use data to define the field? How can they use data to build stories across their network of writers? He shares a few examples of human driven stories. They visualize through mapping, but only with one-off projects. He wants to build capacity within the writers to work with data more often. Meghann works with the City of Somerville to bring data and information to residents. She plans many of these meetings each year, and has upcoming ones she wants ideas for. The goal is to have engaging group activities that use data to build resident capacity to participate and get more constructive feedback. Some of their previous attempts were too data-intensive, others too long. Many attendees say they don't want to work with data, but the city is using data more to driven decision making and wants to engage with people around it. Some folks advise reframing the data as information that we need to get the job done. Others remind us that the data is in support of a story or narrative, it isn't the end in itself. Dalia is planning a curriculum for teaching tech literacy related to data and privacy for youth. People are choosing convenience over privacy, but we aren't focusing on helping youth build their capacity to make these decisions consciously and well. She is wondering about other examples in this space, how to get and maintain youth interest, and how to measure the impact. Some folks suggest libraries as good partners, others recommend working with youth to develop the activities. Many folks agreed with Dalia that the topics and examples will vary from community to community. Pedro works with communities around the world as part of the D-Lab at MIT. He shares a project with a small community in Uganda that focused on building their capacity to design their own tools. Participants there showed significant innovation in the tools they built to help solve everyday problems. He doesn't want that to be the end of the story. There is lots of data from the West about how to launch these innovations as products for replication, but nothing appropriate for the people there to read and learn from. He wonders how to provide data literacy for communities that do not have access for formal education. Some folks point at novel ways to share the data. Others point at related projects in various places. We broke into two groups to discuss the case studies and some common themes. Catherine led a group that started with reflecting on the case studies. People started off reflecting on how you pick data and what you want to do with it. Do you start with data, or a story? How do you respect the context of the data? How do you qualitative and quantitative data together well? There are various ways to introduce this to learners - you could start with a problem, or start with some data. Starting with a personal problem can connect the data to the real lives of the people you are working with, while starting with data can sometimes be too abstract. Rahul led a group that was focused on our ability to help people move from data to action. Some people focused in on the idea that you should go from people, to a question, to some data. The ownership of that data is critical - in that it must connect to the experiences of the people you are working with. Quantitative information can be that bridge, that fills in the "how" and "why". The group then thought at a higher level about how to shift organizations’ mindset to be a more data-driven culture. How can you bring in good approaches to using data to create change to an organization that doesn't have that experience? How do you create buy in to a process? Some suggested inspirational examples, while others talked about running competitions with data to create a sense that the data can help the organization. We didn't reach any answers, but had a great session sharing our struggles and potential solutions! Building the capacity of others to do work with data, tell data-driven stories, and create impact is what we all do, so it was great to connect.